The people there were kind and helpful. I got super cute earrings that I love!! A cute and cozy spiritual shop, this was a great place to open my mind to other religions and explore the meaning of stones and candles! Great shop! I never would’ve thought to check this spot out if it weren’t for Nift. Super friendly staff and fun products! Even arriving almost at close time, the girls working there were super nice and willing to help. Super positive vibe in the store, I will be back! The woman who works there and assisted me was so helpful and knowledgeable. Such an awesome space! Very friendly & knowledgeable staff - not pushy or anything which I always appreciate. Plus they have a bird and a cat! Very funky finds there, love it. nice selection of jewelry and stones. Thank you. Ritual Arts offers a welcoming environment with products that anyone could use and appreciate. Coming in here always feels like an adventure and its just enjoyable to be there. 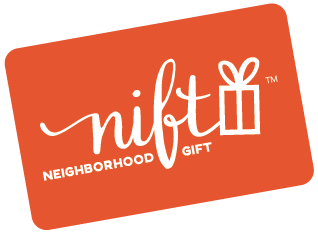 Although it is a little confusing at first, Nift gifts are great ways to explore your community and support local businesses. Incredible selection of unique gems including books, crystals and more! A very good selection of funky jewelry and items! I was so happy to discover ritual arts! I had never known it was there and thanks to Nift I will be a returning customer!!! This shop has a large inventory of incense, candles, jewelry, and gems. Very good customer service with staff who are helpful but not intrusive. Positive vibes and nice workers! Kind employees, vast selection, and a friendly African Grey parrot! What more could you want in one tiny shop? Super cool hippie shop with welcoming staff! I will definitely be back.